The Australian High Country is located in the south-east of the continent, and extends from the Wollemi National Park and the Blue Mountains to the west of Sydney, through the Kosciuszko and Alpine National Parks and south-west into Victoria, almost to the edge of Melbourne. 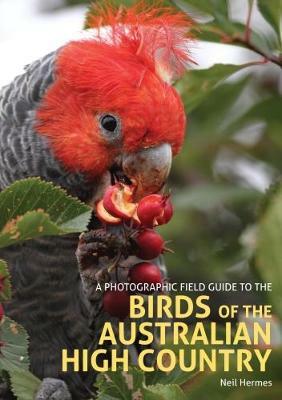 It includes Canberra and the ACT.This book is a fully comprehensive field guide to the 322 bird species of the High Country, including all common, rare and vagrant species. With photographs from the author and the region's other top-quality nature photographers, each species is illustrated with many variants. The guide is focussed on field use to help beginners and experts identify species.For each species the common and scientific names are listed as well as local variations. The main identifying features of each species are described and key facts cover size, habits, habitat, breeding, distribution, voice and status in the region. Distribution maps provide an at-a-glance view of where the birds can be found. The book also includes information on climate and topography, types of habitat, orders and families, residents, migrants, vagrants and highly scarce migrants, topography and the key birdwatching sites. The checklist provides complete information on the local status of each species.